The SOLIDO PROTECT-S press stud system is based on the dual S-shaped spring wire made of stainless steel in the eyelet part. The smooth-running and precise fastener offers a broad application range for firmer textile materials and technical applications. 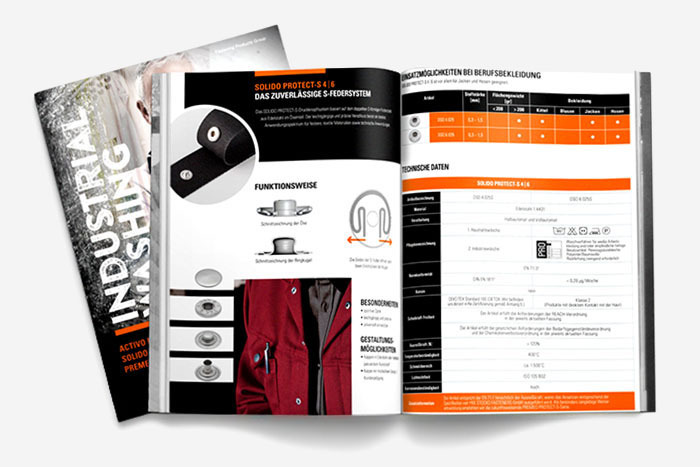 Additional information The item corresponds to the EN 71-1 with regard to the tear-off force if the mixing corresponds to the specification by YKK STOCKO FASTENERS GmbH. We recommend the forward-thinking PREMEO PROTECT-S series as a very durable further development. The design of your garment is decisive for the correct selection of the suitable SOLIDO system. The permissible fabric thickness is determined by the number of layers of fabric on top of each other and their fabric properties at the attachment position. The fabric thickness is measured using a special micrometer. We are happy to support you in this. Please contact us and send us a sample of the corresponding textile. The attachment positions of the SOLIDO system on the garment should be chosen so that unevenly thick layers of fabric are avoided. The design of the cuff widths (including seams) should be such that the pushbutton design to be selected has sufficient space for a secure connection and seams are avoided. For multiple fabric layers, it is recommended to attach seams next to the attached SOLIDO push button. This prevents the superimposed layers of fabric from shifting when subjected to lateral stress.